Have you ever seen someone do a super-man over their handlebars? It’s not pretty. Unfortunately, this is a pretty common bicycle accident and it can have dire consequences: broken collarbones, bloody faces, and worse. Most over-the-bar occurrences happen due to grabbing a little too much front brake. Knowing this, Guardian Bikes was founded with the goal of stopping brake-related accidents. Their bikes are made with a unique, proprietary “SureStop” braking system. This system ensures that power is applied efficiently to both the front and rear brake. Instead of pulling both a right (rear) and left (front) brake lever, kids simply pull one brake lever that activates both the rear and front brakes. (Well, there’s a little bit more to it than that, but you can read more below if you want the nitty-gritty). The cliff’s note version is that the brake system does an excellent job of preventing brake-related accidents. For kids that are brand new to hand brakes or who don’t have great eye-hand coordination, we HIGHLY recommend the Guardian kids bikes. They are also great for parents who worry about bicycle safety and want to have peace of mind that they’ve done everything they can to protect their child. The real differentiator for the Guardian bikes is their proprietary SureStop braking system. If you want this technology for your child, these are the only bikes that have it. If it sounds familiar, it might be because you saw it on the TV show Shark Tank. The braking system is activated by a single brake lever mounted on the right side of the handlebar. Having only one brake lever rather than two is particularly helpful for kids who struggle with coordination or who get easily frustrated on the bike. The single brake lever activates the rear brake. The force to the rear wheel, in turn, activates the front brake. This works better than a single brake lever that is wired to both the front and rear because it takes into account the positioning of your child’s weight on the bike. Not only does this braking system avoid over-the-bar accidents as mentioned above, it also helps kids stop faster and maintain traction even in wet weather. In fact, if you live in a rainy area (Seattle for instance), the Sure Stop braking system makes even more sense. For more information on the Sure Stop braking system, this video helps explain. Before leaving the topic of braking altogether, I did want to mention the brake lever itself. My 5.5-year-old who has tiny hands, did find it difficult to reach the lever. Our 7-year-old tester had no problem. The reach on the brake lever is adjustable via a screw. Make sure to take the time to make sure it is set up properly for your child’s hand. Even so, the positioning of the grip shifter makes it so that kids have to reach at a bit of angle to manage the lever. Because the braking system doesn’t require a lot of force, I don’t think this is a deal breaker. Still, it is something to think about especially for younger kids with small hands. They may be better off on the single-speed version that doesn’t have a grip shifter to get in the way. For this review, we tested the 20″ Original 6-speed bike. 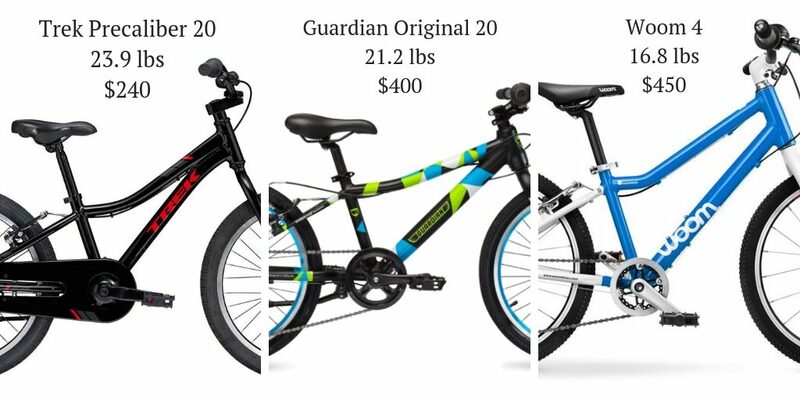 Guardian offers their 20″ bikes in a size “small” and size “large.” The two different frame sizes allow a larger range of kids to fit on their 20″ wheel offerings. In addition to the “original” 6-speed, there is also an original 1-speed version, and a newer, more affordable “Ethos” version. Of course, the lower price tag comes with a trade-off: heavier weight and cheaper components. In other size offerings, the Original and Ethos models are offered with 16″ and 24″ wheels. All bikes have the proprietary Sure Stop brakes and are happily void of a coaster brake. (If you’re not sure why the lack of a coaster brake is a good thing, read our article on hand vs coaster brakes). Most kids being introduced to a 20″ bike have never operated gears before. And let me tell you–learning to use gears can be a bit tricky when you are 5 or 6 years old. That’s why I appreciate the grip shifter on the Guardian 20″. Compared to trigger shifter, grip shifters tend to be much more intuitive and easier for little hands to operate. 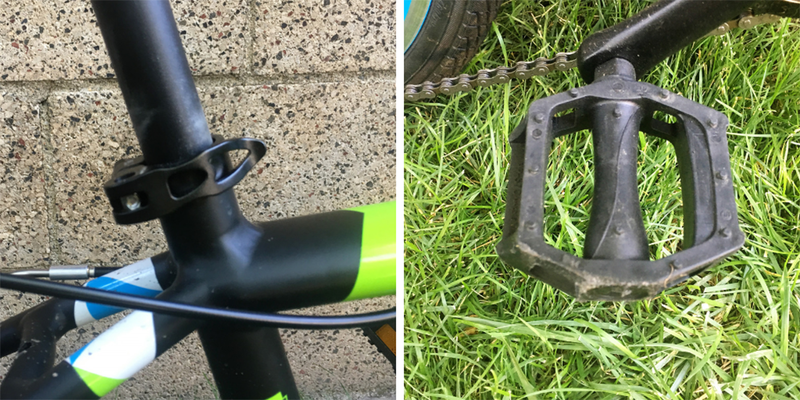 My 5.5-year-old, who is accustomed to shifting but had never used a grip shifter before, got the hang of it quickly and had no problem moving the chain between gears. 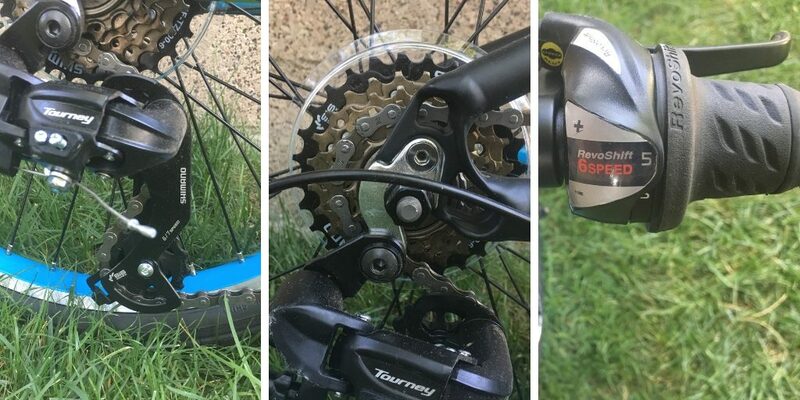 The Shimano drivetrain is high-quality and the 6-speeds provide more than enough gears for young kids to manage both flats and uphills with ease. Over several weeks of testing, we never experienced a missed shift or a dropped chain, which is actually pretty amazing considering that young kids aren’t excellent shifters. 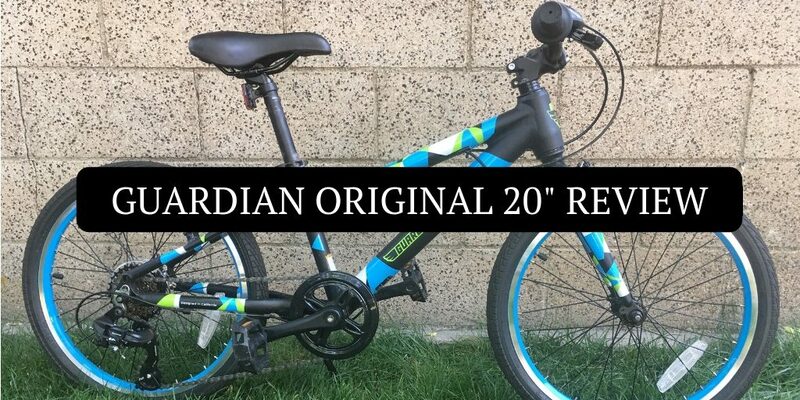 While many kids will benefit from having gears, you may also want to consider the single-speed version of the Guardian 20″ bike. If your child hasn’t yet mastered pedaling without training wheels, for instance, they are better off having one less thing to worry about. The single speed version is also lighter weight, so if you have a petite child or live in an area without a lot of hills, the 1-speed version could be the way to go. Nifty paint job aside, the frame is made from high-grade aluminum which is both lightweight and durable. It has nice clean welds and will hold up well through multiple children. (Note that the fork is steel). 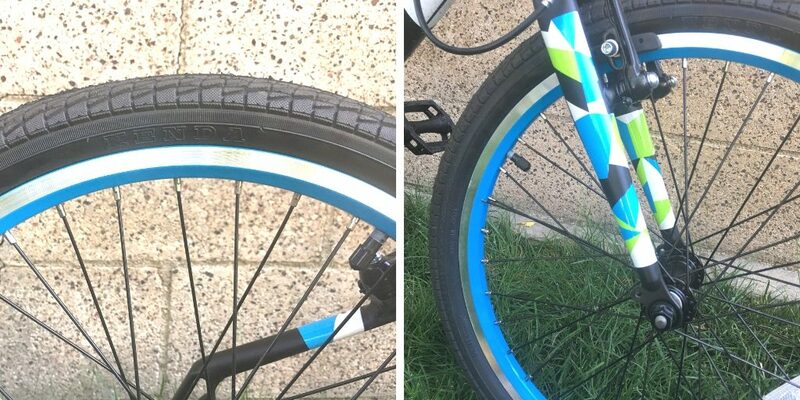 The wheels of the 20″ Guardian are snazzy. And let’s be honest, when you’re 6-years old, the way your bike looks is almost as important as how it rides. The colorful rims look good, and I was pleased to discover that they seem to actually make the bike stand out a bit more when riding in traffic. The bikes has Kenda Kontact tires, which are some of our favorites for everyday riding. The minimal tread pattern is ideal for fast-rolling on roads and bike paths, but offer enough grip to provide traction when riding over gravel or grass as well. The 20″ 6-speed Guardian kids bike weighs in at 21.2 pounds. This is pretty reasonable as far as kids bikes go. The Trek Precaliber 20, for instance, weighs nearly 2 pounds more; and many big box store bikes weigh another 5 to 10 pounds. Compared to some of the higher-end 20 inch bikes, however, the Guardian comes out a little hefty. The Woom 4, one of our favorite 20″ bikes, weighs a mere 16.8 pounds. Those 4 or 5 pounds can make a BIG difference, especially for more petite or less athletic kids. Of course, the Woom costs about $50 more and it doesn’t have the Sure Stop technology. We’ll let you decide what the best weight-price-technology trade-off is for your family. We assemble a LOT of bikes at our house (as I’m sure you can imagine), and I have to say, the Guardian bike was one of the easiest assembly jobs I’ve ever done. The bike comes mostly assembled and only takes 5-10 minutes to unpack and get rolling. It comes with a pre-ship checklist that ensures that the bike has been pre-assembled and inspected before being shipped out. The only thing that stumped me when putting the bike together was that the front brake wasn’t engaging when pulling the brake lever. Thanks to the super-helpful assembly videos on the Guardian website, I quickly learned that the front brake doesn’t engage unless you’re sitting on the bike. Aha! Thanks to the pre-assembly and helpful written instructions and video tutorials, I can safely recommend this bike to parents that aren’t mechanically inclined. Seriously–anybody can manage this! The only thing I wasn’t crazy about on the Guardian is the geometry. Compared to the Pello Reddi, for instance, the Guardian is significantly less upright and more leaned over. This makes it harder to learn to pedal on (if your child doesn’t already know how), and can make it harder to control for timider and less athletic riders. This is particularly unfortunate since the Guardian’s braking system makes it such a good choice for kids with developmental delays or physical issues. 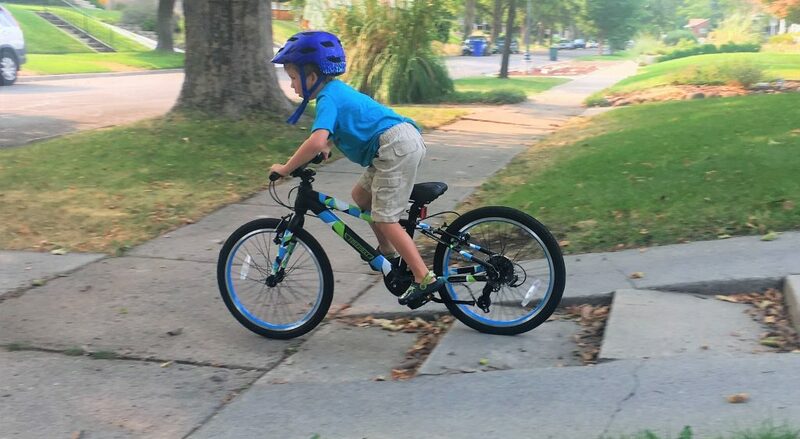 After speaking with Kyle at Guardian about this concern, he did let me know that the Guardian Ethos 20″ does have more upright geometry, so if you have a child that might benefit from a less aggressive position on the bike, consider that version instead. You can also contact the company about installing a riser bar on the bike instead. In addition to the great videos and tools on the Guardian website, the company also offers great over-the-phone assistance. As a kids bike reviewer, I receive a lot of feedback from parents on which companies offer good customer service and which ones don’t, and I’ve heard nothing but positive (even glowing) things about the customer service from Guardian. One of our favorite things about the Guardian bikes is the amazing “Ridesizer” fit tool they offer on their website. It is amazing how many emails I get from parents confused about what size bike to get their child. The Guardian fit tool helps you pick the right size bike without second-guessing yourself, and even differentiates between the correct bike size for an experienced pedaler vs a child just learning to pedal. Genius. As for the sizing on the 20″ Large, we put my 5.5-year-old (who is already a competent pedaler) on the bike. He is on the cusp between the 20″ Small and 20″ Large, but was still able to fit comfortably on the frame. Had he been a new pedaler, I would have kept him on the 20″ Small. 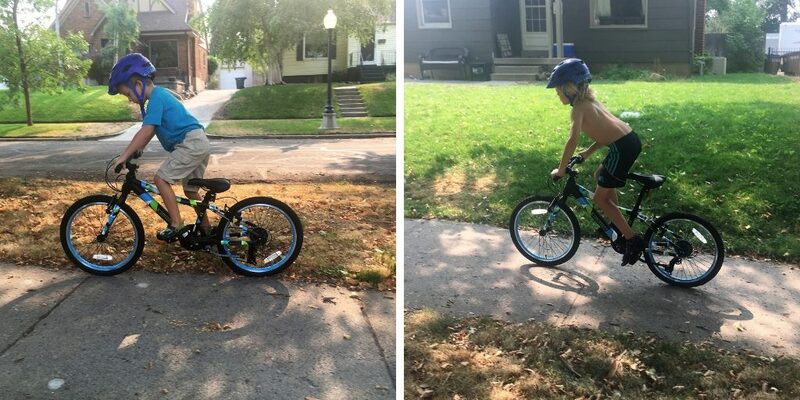 On the other end of the size spectrum, we had our 7-year-old neighbor (in a 7T pant) test the bike. He is significantly taller than my son but was still able to comfortably fit on the bike as well. Despite looking like a mountain bike, the Guardian bikes are not mountain bikes. I wouldn’t recommend these bikes for families who plan on doing any serious off-road riding or even spending lots of time at the pump track. Why? Trail riding requires the ability to use the brakes independently of one another. Even at a young age, it is important for kids to begin developing these braking skills to develop as a rider. If you’re looking for a mountain bike, check out our list of the best 20″ mountain bikes instead. Additionally, if you have a child that has already mastered hand brakes and is comfortable with them, I probably wouldn’t backtrack to the Sure Stop system. For everybody else, the braking system is great. The Guardian Original 20″ has a quick-release on the seatpost. This allows you to easily raise the seatpost as your child grows, tool-free. The bike does NOT have quick-release skewers on the wheels. This means you do need a wrench to remove the bolts when your child gets a flat tire. Not ideal. A kickstand is included and is easy for kids to operate. If you don’t want/need it, take it off to save a few ounces. There are NO training wheels on the bike. If your child hasn’t already learned to pedal, simply remove the pedals (or don’t put them on when you first unbox the bike). Lower the seat all the way and have your child practice scooting like they would on a balance bike. Once they can coast and balance with no feet, add the pedals back on and teach them to ride. We dig the pedals on this bike. They are nice and wide to provide a stable platform for pedaling, and the plastic pins provide traction without banging up shins when/if they hit your child’s shins. Not sure how the Guardian 20″ bike stacks up against other options? The one thing that the Guardian has that you’re not going to find anywhere else is the SureStop braking system. So if that’s important to you, don’t bother shopping around. 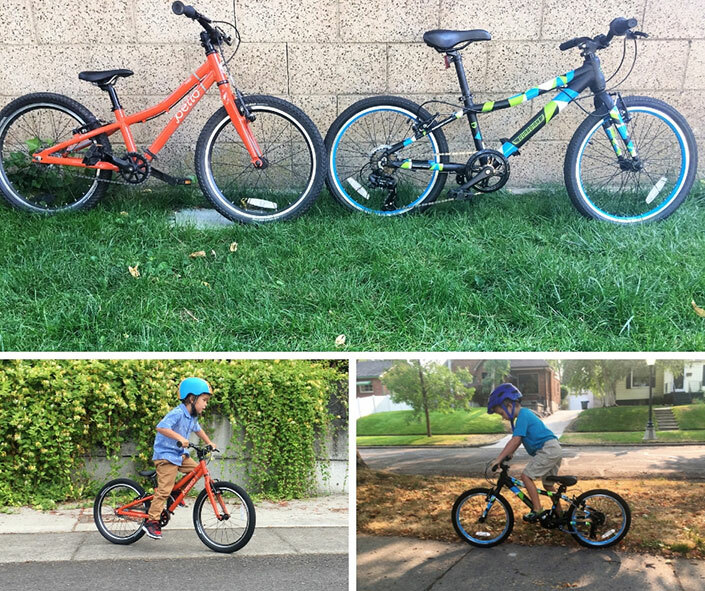 If your child is new to a bike with hand brakes, has struggled with hand brakes in the past, or if you simply worry about bicycle safety, the Guardian kids bikes are a best buy. 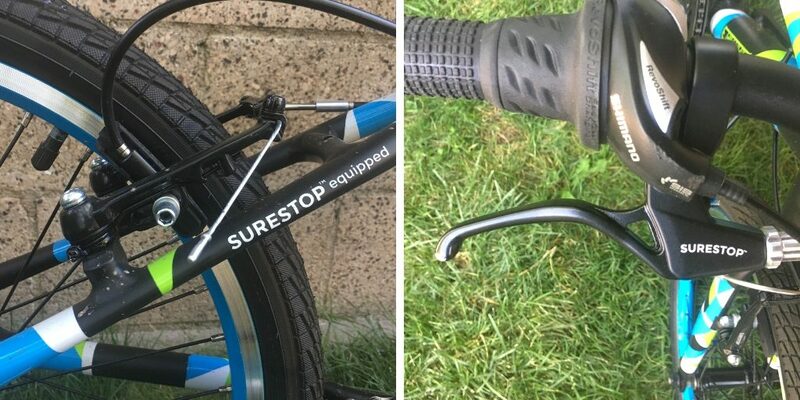 The SureStop braking system performs as advertised, helping prevent brake-related bicycle crashes. The high-quality components and reasonable weight also make the bike more enjoyable, more rideable and more durable than any bicycle you might buy at a big box store. Like to be super informed before you make a purchase? So do we. Here is some more reading to help you make the best decision. Big step up from Walmart bikes. You won’t find Kenda tires, v-brakes, or a Shimano drivetrain on Walmart kids bikes.